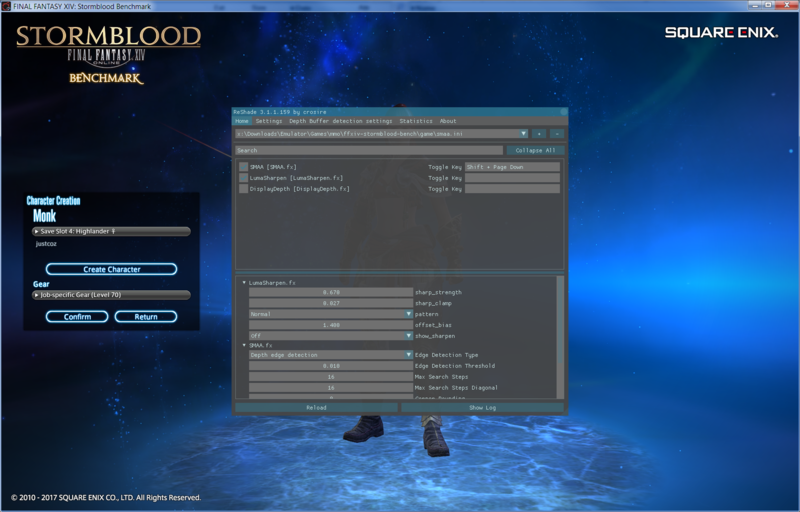 Reshade was working fine with Final Fantasy XIV - A Realm Reborn, but a day ago it stopped working. When the game launches I just get a black screen and it hangs forever, I noticed when I run FFXIV with Reshade that FFXIV is using... all 16gigs of my RAM. When I delete the appropriate Reshade files from the game's folder, it launches no problem. Last Edit: 1 year 1 month ago by Diceman. Strangely, the benchmark starts fine with 3.1.0 and 3.1.1, so this must be specific to a recent game patch. 2018-03-07T04:16:31:725  | INFO  | > Succeeded. 2018-03-07T04:16:31:726  | INFO  | > Succeeded. 2018-03-07T04:16:31:747  | INFO  | Initialized. 2018-03-07T04:16:31:768  | INFO  | > Adding 'CS_OWNDC' window class style flag to 'FFXIVGAME'. 2018-03-07T04:18:32:506  | INFO  | > Succeeded. 2018-03-07T04:18:32:528  | INFO  | Initialized. 2018-03-07T04:18:32:747  | INFO  | > Adding 'CS_OWNDC' window class style flag to 'FFXIVGAME'.